Hugh MacColl (1837-1909) was a mathematician and logician who was born, raised and educated in Scotland and after a few years working in different areas of Great Britain moved to Boulogne-sur-Mer (France), where he developed the greater part of his work and went on to become a French citizen. Hugh MacColl was well known in his time for his innovative contributions to logic. MacColl's work represents one of the first approaches to logical pluralism. His first contribution to the logical algebras of the 19th century was that his calculus admits not only a class interpretation (as in the algebra of Boole) but also a propositional one. Moreover, MacColl gave preference to the propositional interpretation because of its generality and called it pure logic. In Symbolic Logic and its Applications (1906) (reprinted in our volume) MacColl published the final version of his logic(s) where propositions are qualified as either certain, impossible, contingent, true or false. After his death his contributions seem to have received neither the acknowledgement nor the systematic study they certainly deserve. Moreover, many of his ideas were attributed to his successors; the most notorious examples are the notion of strict implication, the first formal approach to modal logic and the discussion of the paradoxes of material implication normally attributed to C.I. Lewis. The same applies to his contributions to probability logic (conditional probability), (relational) many-valued logic, relevant logic and connexive logic. Less known is the fact that he also explored the possibilities of building a formal system able to handle reasoning with fictions. The latter seems to be linked to his formal reconstruction of Aristotelian Syllogism by means of connexive logic. 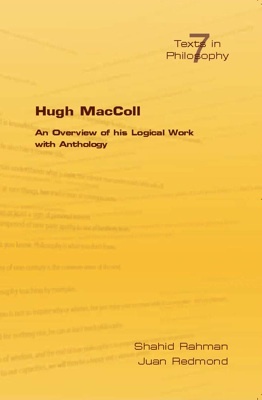 The present volume includes a reprint of MacColl's main writings on logic.